How ironic. I planted the type of ivy you see above (Hedera helix 'Gold Heart') some 15 years ago. It's like it's frozen in time. It does nothing. There's one little loop of it standing about 12 inches high. Another piece goes up the wall about three feet (what happened to the saying, "the first year it sleeps, the second it creeps, the third it leaps"? How is it that I'm stuck in"it sleeps"?). 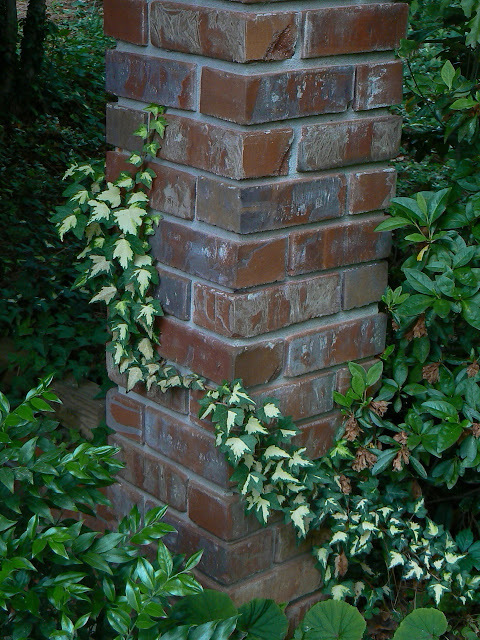 I envisioned a patch of this lovely English ivy on the north side of my house, where I wouldn't mind a bit of color and could control its growth. I could use it at Christmas or just enjoy the pretty variegation to light up a shady area. About the same time, Margaret Moseley planted 'Gold Heart', at my recommendation. I assured her that this selection was not very aggressive. All was well for a while, as in the photograph above showing a pillar of Margaret's carport. Now, she's very unhappy with me. The ivy has spread everywhere in her garden - on trees and on the ground. She has to rip it out, and it's a constant battle, just like the one I'm forever waging with the common, all-green English ivy. I've read that there's no such thing as a "green thumb", but I don't know. Margaret has an instinct about getting plants to grow. 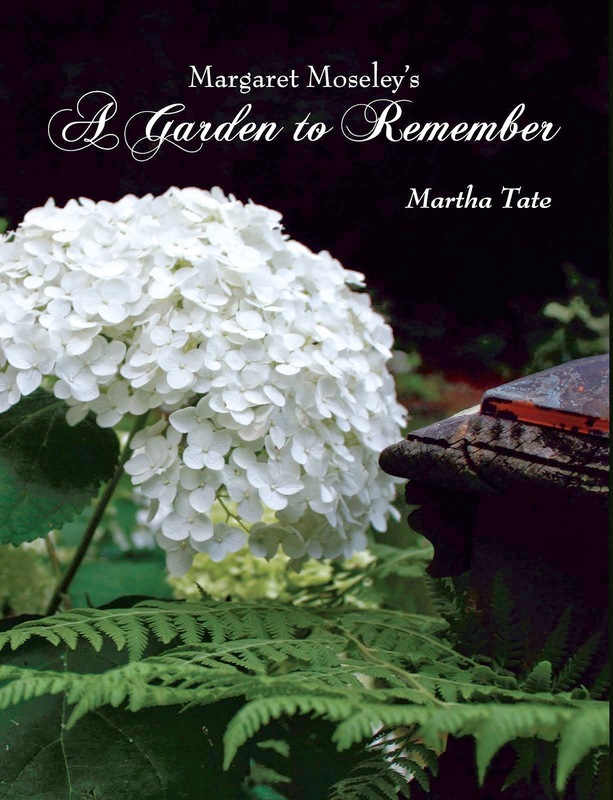 One thing that probably determines her success as a gardener is if something isn't doing well where she's planted it, she moves it without hesitation. She doesn't wait 15 years. So, a New Year's resolution: Move my stunted plant to the base of a newly cut tree stump and see what happens. I have a feeling that if I live to be 95 like Margaret, that stump will not be covered. But, we'll see where I am ivy-wise at the end of this year. The area around the stump should have the exact right type of soil for 'Gold Heart' - rich, woodsy dirt that is both moist and well-drained. Maybe since it's been sleeping so long, we can just skip that part and go directly to "it creeps." I hope I can give you a good report well before the dawning of 2013. Please don't plant Hedera helix. It is indeed beautiful. And the picture you show is absolutely top notch. But see how Margaret has to keep beating it back? Well, when she is unable to keep it up, the ivy will go sky-high and bloom. The birds will love it's pretty black seeds, and poop them out all over. I'm afraid most of the time ivy is rampant, and being evergreen it carpets the woodlands. Our little ephemerals, like Hepatica and Trout Lily, won't survive that sort of competition. We recommend Virginia Creeper instead- since it goes dormant in winter the other plants can get sunlight when they are due it. Besides, the fall color is so fabulous. The problem is not, on the surface, with conscientious gardeners, but with those who eventually neglect their duty at keeping their ivy from going to seed. Or who move house, and are no longer around to do so. Someone else may move in who has no idea. You are absolutely right. Planting Hedera helix is crazy and asking for it. Luckily, Margaret has a great helper who has the 'Gold Heart' under control. I have several variegated ivies, all planted on the ground, and they have never leapt and seem never to grow. But, when I moved onto these four acres, many ground areas were covered in ivy. Ditto the trees. I've managed to get all the ivy off the trees, and now I'm surreptitiously working on the neighbors' trees. I have a much worse problem with wisteria, but I've made some headway there. And, what a good point about moving away and leaving English ivy out of control. For me, compared to wisteria, it's a cinch to pull up. At the farm, I battle kudzu and privet. So many invaders!